Adding the monthly average Ontario demand to the graph indicates how poorly matched wind output is to Ontario's demand pattern. The winter match is not as good as it appears either. During what may be this winter's peak demand, at 7 pm on the 22nd, the IESO report shows output of 400MW from 1543MW of wind capability - but Comber is shown as 21MW of capability (in's 166) and Point Aux Roches as 10MW (it's 48.6). The actual capability is closer to 1726MW, making the capacity factor 23%; only one of the 5 daily peak demand hours this winter have had output above this 23%, which is slightly over half of the average wind capacity in January 2011. I erred in attempting to correct this article earlier - probably. At 7pm (hour 19) of the 23rd, demand hit it's highest level of the winter at 22426MW (here). At that time wind production on the IESO grid was reported as 357MW. An honest accounting of the Output and Capability would have shown Comber at a 166MW capability (not 37), and Point Aux Roches (shown as PAROCHES) as 48MW (not 12), making the capacity factor 20.7%. Estimating the capacity factor of all wind and solar on the grid, the capacity factor was approximately 16% at peak. At 7 pm the IESO home page shows demand at 22610MW, which will be a new peak for the winter. 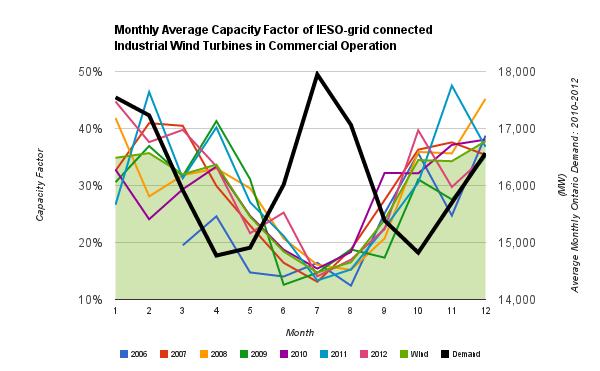 Wind production on the IESO-grid is reported at 105MW, which is ~6% of capacity/capability. Extending that to embedded wind and solar (unreported), approximately 2600MW of wind and solar are likely producing ~122MW, or 4.7% of capacity/capability, during winter's peak demand.